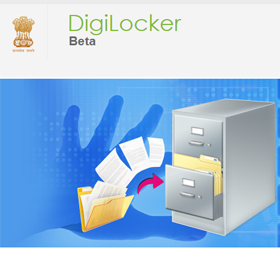 Government of India has launched a scheme called DigiLocker. This is an Aadhaar based Govt of India owned full secured National Digital Locker System. The new system is to replace the traditional way in which if any agency need documents then you need to submit it in physical or scanned image format. With a secured centralised government owned storage system user can store the digitally formatted documents and agencies can verify this in a fast and easy manner. Anyone having an Aadhar number can own a DigiLocker. Those having an Adhar card can login to www.digilocker.gov.in and upload their scanned copies of all important documents like Graduation certificate , 12th (plus two) marksheet,Tenth standard marklist, Electricity bill, PAN card,Passport documents, Driving License etc. You can upload pdf, JPG, JPEG, png, bmp, and GIF types of files. So when ever you will need those documents for verification by govt agencies while applying for servcie, you can directly give your DigiLocker number. The agencies can verify those documents and that is all, no more hassles of carrying documents and tons of photocopies. It is very safe and secured. You can access it anywhere and at any point of time. How to create your DigiLocker account? On the popup screen enter the Email Id and your password, that's all your DigiLocker account is successfully created. There are some concerns related to security of document links shared by email share option , click DigiLocker Email share security to read it. Sharing files as digitized document is a cool idea and can save lots of papers, infact more trees can be saved. Other side is the security of the upload documents. More security options are to be added to the system to make it a perfect one.